In the minutes, hours and days following a school shooting, those directly affected struggle to understand what happened. And those looking to make a buck pick up the phone or draft an email. “It couldn’t have been more offensive,” she said. The emails kept coming. And then the people. Counselors showed up. Many certified and well-intentioned. At least one a complete fraud. Therapy animals. Dogs. Even a pig. Berg sent the pig to comfort middle school students. Within an hour, the pig’s owner had unrolled a sleeping bag and curled up with the pig. The pig wouldn’t let children come close. The pig didn’t even like children. The requests and offers kept coming. Berg, already worn down from days of nonstop work, was stunned at the brazenness. “In the moment you’re so vulnerable it’s pretty hard to imagine,” she added. Profiteering from school shootings is not an isolated event, school shooting experts said. In fact, an industry of sorts has developed around mass shootings. “I get calls weekly from companies that want to sell and market products, and we do not endorse any of them,” he added. Those products range from the absurd – bulletproof whiteboards that can be used as shields, for example – to the potentially valuable, including experts in trauma, school-shooting analysts and others. 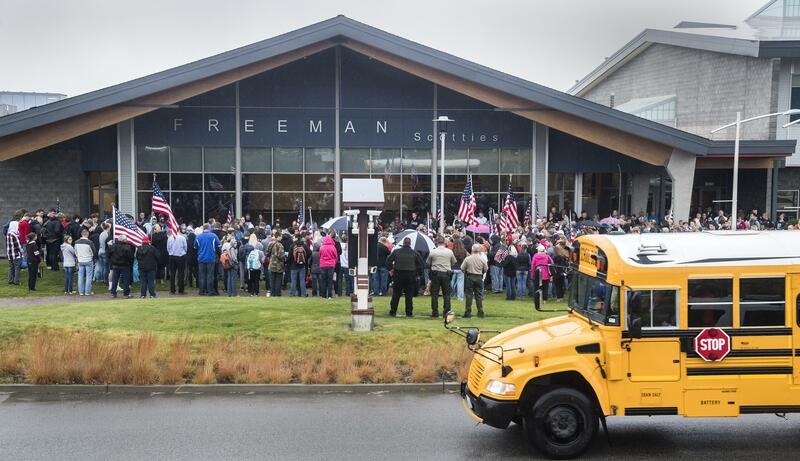 Following the shooting at Freeman High School two and a half weeks ago, the small rural school district was inundated with hundreds and hundreds of phone calls and emails “to support Freeman,” said Superintendent Randy Russell. However, unlike in the Marysville case, Russell said the offers have been supportive and well-intentioned. The district has benefited from a few things. The day of the shooting, Berg flew to Spokane to offer support and advice. One thing she said? Additionally, United Way and the Empire Health Foundation are coordinating donations and services. United Way is overseeing all monetary donations for the district, Russell said. As of Friday, United Way had received about $50,000 in donations. United Way will not keep any of that money, a spokeswoman said. The Empire Health Foundation has coordinated volunteers, including counselors from neighboring school districts. Cheri Lovre, a crisis expert who helped at Marysville, also came to Freeman. Lovre has worked with schools recovering from shootings since the late ’90s. After a shooting, people “come out of the woodwork,” she said. Some of them have good intentions, even if their timing is bad. “It may not at all be the best match for what the school or the community needs at that point,” Lovre said. Others’ motivations are more predatory. At one education conference Lovre attended, an engineering firm was peddling a crisis response manual for schools. The firm knew nothing about schools, school shootings or education. “It’s very easy to see the people who are there to make money and the people who see schools as a market,” she said. Kenneth Trump, the president of the Cleveland-based National School Safety and Security Services, echoed Lovre. A “cottage industry” has developed around school security, he said. For example: Some former military and law enforcement officers offer training and tactics on how to confront an active shooter. In one such training, they recommend teachers and students throw their shoes at the shooter. “(These are) people who are well-intended, but it’s not well thought out,” Trump said. Most teachers and students have no experience with violence. Encouraging them to directly confront the shooter only puts them in harm’s way, Trump said. In the case of the Marysville shooting, Berg said, those truly hoping to help didn’t just show up at the school. They emailed or called and waited for the district to respond. “There are folks who really try to promote their own careers by helping in school shootings,” Berg said. Todd Inouye sees it differently. Inouye is the inventor of the Factor X Backpack. The $169 product converts into a bulletproof vest and is packed with emergency supplies. Inouye called The Spokesman-Review within an hour of the Freeman High School shooting on Sept. 13. He believes his product could save lives. “I read the news quite a bit. I know what’s going in the world. When something like this happens I’m kind of aware of it,” he said. His own 11-year-old daughter uses one of his bulletproof backpacks. Inouye admits his business is struggling. He’s sold only a hundred or so backpacks, despite the fact that over the last 10 years he’s poured money into the endeavor. The right exposure, he believes, could change all that. And if nothing else, school shootings are high-exposure events. Local and national media flock to the scene and coverage often lasts for weeks, planting such incidents solidly in the public eye despite their relative infrequency. Less than 3 percent of all youth homicides occurred at school last year, according to the National Center for Education Statistics’ 2016 school crime and safety report. That number has stayed roughly the same since 1992, when the center started collecting data. Overall, there was roughly one student homicide or suicide for every 2.8 million students enrolled. But the tragic and shocking nature of school shootings garners massive attention and, for some entrepreneurs, promises quick and massive exposure. “Sadly, this is some people’s 15 minutes of fame,” Berg said. Profiteering isn’t limited to post-shooting products and services. Nationwide, the market for educational security systems grew to $4.9 billion in 2017 from $2.7 billion in 2012, according to research company IHS Technology. Companies and parents urge school districts to invest in stronger, more expensive security apparatuses. That’s despite the fact that the vast majority of in-school violence is perpetrated by students. In addition to services and products, lawyers often descend on school shootings, Stephens said. “It’s just sad to see the schools blamed for everything, because generally they are the deep pockets and that’s where the attorneys go for money,” Stephens said. As for the Marysville shooting, Berg said the school district learned its lesson quickly. Administrators started rigorously vetting offers, with a staff member assigned specifically to the job. When Berg visited Freeman High School shortly after the shooting, she was glad to see the school already vetting offers of assistance.